The Book Of Tents is going to try to encapsulate a complex, engaging and for some, a terribly addictive subject. It is intended to be a reference on how to build tents, tented structures such as geodesic domes, and buildings with tension membrane elements that really are still tents, that although advanced in both materials and design, a nomad from the time of the Pharaohs would understand. Here are some excerpts from the introduction. The modern tent isn't very far removed from its ancestor, even though tents may be considered the oldest form of man made structure. When man first moved out of his cave, his first house will have been animal hides stretched over small branches. Three million years later, we, as tentmakers and erectors, are still dragging their equivalent around with us, so we may justifiably call ourselves the second oldest profession. 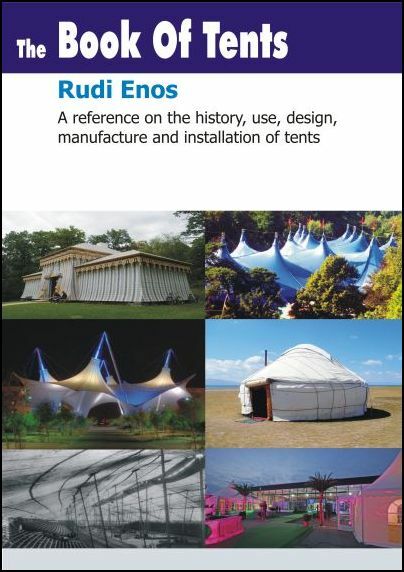 This book, the second of three, The Book Of Tents, covers all kinds of tented structures and provides an in depth appraisal of the design, analysis, manufacture and installation of tension fabric structures. The first, The Sky Is Not The Limit, is intended to be the first of 3 tent related books. The book describes the development and use of the largest temporary structures for events in the world. The third Tents and Events is a reference on all aspects of temporary installations, stages, seating grandstands, tented structures, exhibition vehicles and an overview of health and safety issues of all of those. Since the beginning of time, man has used tents to house his family. Either as temporary cover, as emergency shelter, or as used by Nomadic tribes, who often live nowhere else. The tent has been part of our culture and traditions for the whole period of civilisation. Most people tend to look at the massive tented constructions at trade fairs, music festivals, and mobile exhibitions as an ultimately modern concept. But, as in many spheres, we find that this is not true. From the time of Alexander the Great and possibly further back in time, to the ancient Roman 'Volariums' used to provide shade over Coliseums, to the steppes of Mongolia and the 12th century Spanish 'Envalet's', strung from buildings to cover streets, to the massive German beer tents in the late 1800's, we can see that far from being an emergency tool, the tent is an appliance as old as the dawn of time. And far from being used for temporary accommodation or for emergency, many peoples and races never knew an existence other than in tented structures. The many different types of early building techniques have been covered extensively by writer more knowledgeable than I am, and I do not intend to go into the many variations of the skin covered 'Black Tent' which isn't black in certain parts of the world as the goats aren't black but brown! We appear to be covering a period from 40,000 BCE to the present day, so I will cover the significant issues that are relevant to the topics of the book. Every book about tents or architectural membrane structures starts with a mention of prehistoric caves, Yurts, Gers and Kibitkas and moves on to Circus Big Tops. For those who have read other books I can only say that history is a big part of any subject and to ignore the past is to not understand the present. In the same way that the history of human achievement can be measured by the storage of information, the development of tents has been all about the advances in materials. The stories of huge pavilions made from silk in ancient Asia also had stories of how the men climbed the roof to repair it. Canvas marquees and circus big tops would split under their own weight when old and wet, a lasting reason to use synthetic fabrics for performance textile products. By way of explanation, I started working on canvas tents that did indeed split when wet, a very good reason to learn about synthetic materials. I was also lucky to be designing tents when there was no rule book. I had no previous experience of tent making and had to make my own mistakes, luckily none of which had any lasting consequence. No structural calculations, nor computers. I used one of those historical relics called a drawing board. So my journey has sort of mirrored the development of tents as a whole. Now, I use a fantastic piece of software created by our new friend Martin Brown who has worked on some of the greatest architectural fabric structures ever built. This software allows the designer to explore in a way not considered feasible before. This means that it is possible to try things 'just because I can'. It is a great aid to design and something that those tent makers on the ancient silk road would not have been able to comprehend. Stone age habitats. Portable homes made from Mammoth bones and hide have been found at Mezhirich in the Ukraine in 1965. Part of a mammoth hunters settlement, a total of four huts were found. These huts were almost certainly portable as the hunters followed the mammoth herd around. Large bones covered with hide or woven vegetation have been reported around the world. Evidence of a wooden framed hut was found at Terra Amata near Nice, France which was dated to the Mindel Glaciation or between 450,000 and 380,000 BCE. The ephemerality of the materials makes it almost impossible for the original cloth or woven reed type cover to have survived, but in the frozen wastes of the tundra complete bodies of animals have been found with grass still in their mouths. "Old tentmasters never die, they simply get packed away for the winter and hauled out again in the spring....."
2.11 SPEED - QUALITY - ECONOMY - choose two.